Cookies are flying in fast. Click the map to see where they are coming from. Click here to see all of the cookies.. 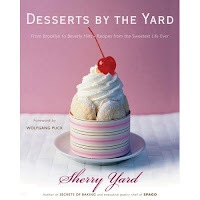 Submit your cookies from Canada, and you might win a copy of Sherry Yard's new cookbook. See details here. Would you like to participate? See details here. You have until Dec. 24th. Sarah of What Smells So Good? from Oshawa, Ontario, Canada. Are you missing the warm breezes of summer and cool, creamy banana splits? Sarah is (remember she's from Canada, where it's pretty darn cold right now). So she came up with this ingenious recipe for Chipper Banana Split Cookies, studded with mini chocolate chips and marshmallows. Mmmmm... good. Vibi of Le casserole carre from Montreal, Quebec, Canada. 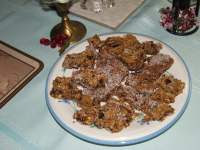 Vibi shares her recipe for Florentins which are baked with colorful dried fruit and rich dark chocolate. Vibi's remarkably chewy, satisfyingly sweet Florentins would be a delicious and elegant addition to any Christmas feast. Sarah of What Smells So Good? from Oshawa, Ontario, Canada. 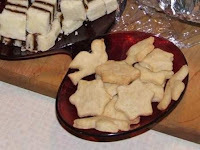 Sarah shares a recipe for her Mom's Shortbread Cookies, a Christmas classic. 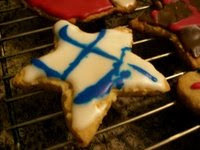 Always a favorite with Sarah's family, these cookies will quickly become a favorite of your family's as well. Whatever you do, Sarah says to use plain old fashioned butter, nothing fancy-shamcy needed here. Sara of I Like to Cook from Kamloops, British Columbia, Canada. Sara was so pleased with a new recipe for Chunky Toblerone Shortbread Cookies that she decided to share them with all of us. (Thanks, Sara!) I always have Toblerone around the holidays but have never baked cookies with it. Now that I have this delicious and easy recipe, that's definitely going to change. Sarah of What Smells So Good? from Oshawa, Ontario, Canada. 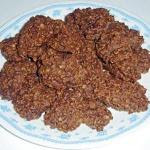 Sarah shares a recipe for Chocolate Coconut Cookies. For Sarah, these cookies elicit holiday joy and wonderful memories of her high school friend Vicki, from whom she got the recipe. Sarah of What Smells So Good? from Oshawa, Ontario, Canada. 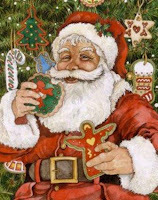 Sarah has made Santa happy this year by baking him a batch of Divinely Dark Cookies. Not only are these cookies intensely chocolate-y but they're also wheat and gluten free. 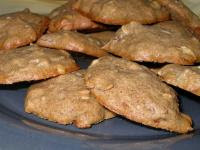 Yummy and good for you, now that's a special cookie recipe. Elizabeth of blog from OUR kitchen from Toronto, Canada. Aren't these Colored Sugar Cookies absolutely delightful? Since the dough is colored, it's especially easy for the wee ones, like Elizabeth's two year old niece, to make their own. Of course, it isn't just kids who will adore making these animal cookies--Elizabeth and her sister shared plenty of laughs too creating those adorable pink pigs and green elephants. Renee who posted to Taste T.O. from Toronto, Canada. Renee is feeling the Christmas spirit and has been baking lots of goodies to give to friends. Renee's friends are really lucky this year; they'll be receiving prettily wrapped elegant Melt-in-Your Mouth Shortbread. Sarah of What Smells So Good? from Oshawa, Ontario, Canada. Sarah is afraid that eating too many unhealthy cookies isn't good for Santa's health. So today she made him a healthier treat made with whole wheat flour. These crispy, light Caramelized Christmas Cookies aren't short on flavor since they are infused with maple and vanilla flavoring. I think Santa will definitely like them. Sarah of What Smells So Good? from Oshawa, Ontario, Canada. Vegans will be happy to try Sarah's self described "veganized" and "semi-healthified" Tri-Flour Sugar Cookies. 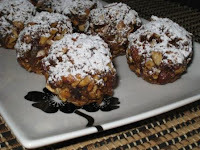 They're nutty, chewy, and and perfectly sweet, especially to Sarah's dad who loved them. Aren't dads great? Sarah of What Smells So Good? from Oshawa, Ontario, Canada. 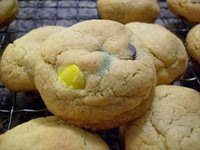 Sarah's playfully named Nuttiest Rainbow Cookies not only taste good but are pretty good for you too. Made with whole wheat flour, low-fat yogurt and low-fat peanut butter, Sarah cut back on fat and cholesterol but not on flavor. Elizabeth of blog from OUR kitchen from Toronto, Canada. Elizabeth had no idea that when she and her husband visited the Art Gallery of Ontario, they would leave with a recipe for the best shortbread they ever tasted. 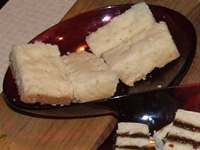 This Shortbread recipe is from The Grange, a lovely 19th century estate located near the gallery. Thanks to Elizabeth's generosity, we can enjoy this shortbread too right from the comfort of our own homes. Sarah of What Smells So Good? from Oshawa, Ontario, Canada. Kids and adults alike will gobble up these Smartie Pants Cookie Drops. No wonder. 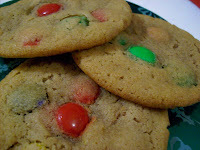 A cookie with candy baked in? Who could resist? Kevin of Kevin's Closet Cooking from Toronto, Canada. Chances are you're familiar with Tchaikovsky's famous ballet The Nutcracker, which means you're familiar with the dance of the sugar plums fairies. But do you know what sugar plums are? Thanks to Kevin, you do. Sugar Plums are simple-to-make sweet concoctions chock-full of crunchy nuts and chewy dried fruits and dusted with snowy icing sugar. Sarah of What Smells So Good? from Oshawa, Ontario, Canada. Sarah shares three more creative cookies with us. Her Fusion Cookies are a savory East-meets-West cookie made with creamy sesame tahini and chewy dried fruits. If you like Oreo Cookies (and who doesn't? 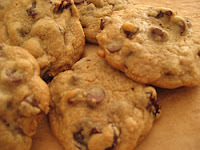 ), then you'll love Sarah's Perfect Cream-Filled Chocolate Cookies. Even better than the real thing, these cookies are just as delicious but are wheat-free, egg free, and vegan. Who wouldn't like that? Sarah's Soetkoekies hold a special place in her heart. These Dutch cookies are a cherished treat in South Africa, and since Sarah's dearest school teacher, Verity, was from South Africa and of Dutch descent, these cookies bring back lovely memories of her. Elizabeth of blog from OUR kitchen from Toronto, Canada. Elizabeth doesn't normally bake a lot of cookies throughout the year, but at Christmas time, she feels compelled to. That's good since she shares two tasty recipes with us today: one savory, one sweet, both delicious. 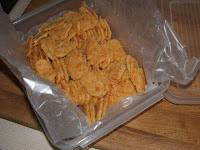 Her savory Cheese Cookies would make an unusual appetizer, much better than ordinary crackers. Her Ginger Shortbread Cookies made with fresh ginger are as aromatic as they are delicious. 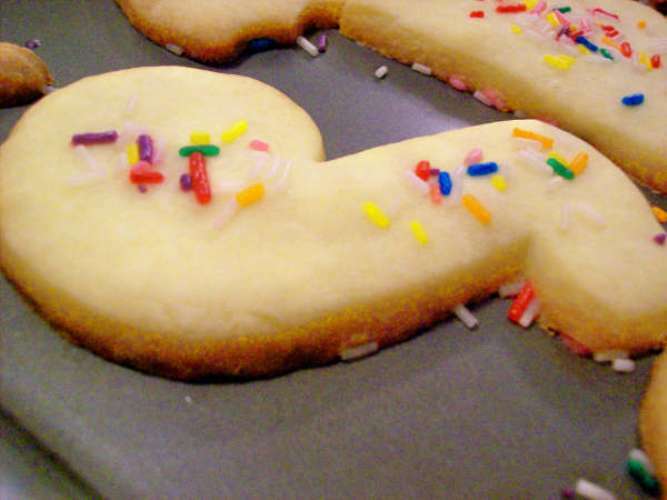 Plus Elizabeth uses tiny cookie cutters, so her guests can eat more than one without feeling guilty. Sarah of What Smells So Good? from Oshawa, Ontario, Canada. Sarah's been on a brownie binge lately (thank goodness) and is sharing two delicious recipes with us today. In honor of a favorite childhood show that Sarah used to enjoy, she named her first recipe Sharon, Lois, and Bram's Brownies. Made with chocolate chips, cocoa, and mini marshmallows, these brownies are a true kid-pleaser. For an adult-pleaser, look no further than Sarah's Holly Brownies. They may just be the fudgiest, moistest brownies ever. 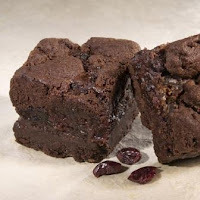 Made with dried cherry "holly berries" and laced with fresh, aromatic mint, these festive brownies will be much more memorable than any Christmas sweater you might receive. Lisa of Lisa's Kitchen from London, Ontario, Canada. They're a little bit cookie, a little bit truffle, and whole lotta yum! 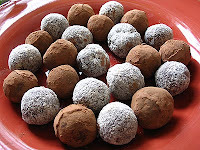 They're Lisa's Best Ever Rum Balls. These easy-to-make and versatile cookies are an instant crowd-pleaser which is why Lisa has been making them for three years and plans on making them for many more. Elizabeth of blog from OUR kitchen from Toronto, Canada. Don't think there can be a cookie called "Food For the Gods" that's also easy to make? Think again. Elizabeth says these cookies are so simple you'd even have time to squeeze in a batch on Christmas Eve. I might have to see if she's right because these regal cookies contain my favorite ingredients: graham crackers, chopped dates, and chopped nuts.